Seems every day there’s another bit of news about what what fats are good and what fats are bad and what they’re doing to you. Omega-3, unsaturated, trans fats…what the heck do these words actually MEAN? They’re all words that describe the chemistry of fats and related molecules, how they’re structured, how they’re shaped — all of which determines what they do. 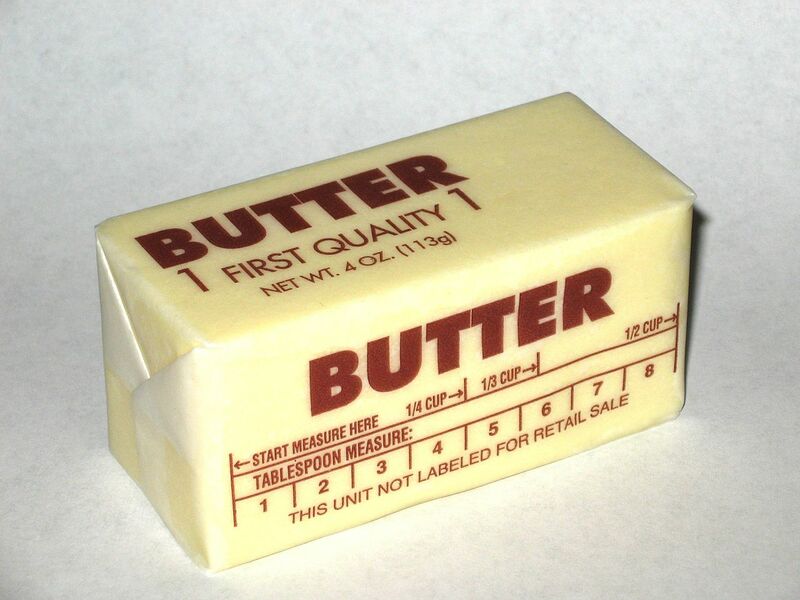 Today I present to you a glossary of fats and such, going over some of the fat lingo you see and hear most often and what it means if you look at fats not as the things around your waistline, but as the carbon- and hydrogen-filled chemicals they are. 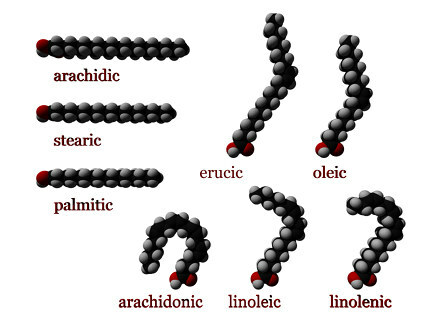 Lipids: The superfamily of organic (carbon-containing) molecules that includes fatty acids. It also includes oils, waxes, hormones and certain vitamins. What all of these molecules have in common is that they either are hydrophobic (they don’t mix well with water) or amphiphilic (they have both hydrophobic and hydrophilic — water-loving — properties; they’re water’s frenemies). All fats are lipids, but not all lipids are fats; for instance, cholesterol is a lipid, but not a fat. Fatty acids: The building blocks of fats. Every fatty acid has two basic components: a carboxyl group (a carbon atom with an oxygen attached to one side and a oxygen and hydrogen attached to another) and a chain of carbons studded with hydrogens. That chain can be short (fewer than six carbons), medium (six-12 carbons), long (13-21 carbons) or very long (more than 22 carbons). Because they can be broken down into large numbers of molecules of ATP (the cell’s batteries), fatty acids keep the cell going. They’re also the building blocks of more complex fatty molecules like triglycerides. Essential fatty acids. Fatty acids we need to survive but which our cells cannot synthesize on their own. We have to get them from our diet. Saturated and unsaturated fatty acids. This is a pairing you’ve probably heard a lot about in the press and from your doctor. But saturated and unsaturated with what? These words are really just ways of describing the structure of a fatty acid, and refer to the number of hydrogen atoms bound to a fatty acid’s carbon chain. To understand what saturated and unsaturated mean from a chemical standpoint, you have to know a little organic chemistry; bear with me for a second. Every carbon atom has space to bind to four other atoms. There are different ways it can use that space, especially if it wants to bind to other carbon atoms. For instance, it can bind to another carbon and three other atoms, in which case there would be what’s called a single bond between the two carbons. Or it could bind to another carbon and two other atoms, in which case what’s called a double bond would form between the two carbons. Now we come to the meat of it. Saturated fatty acids are fatty acids in which every carbon in the chain has single bonds with the carbons on either side of it, and is also bound to two hydrogens (so every carbon is bound to two other carbons and two hydrogens; there’s our four binding spaces occupied). There are no double bonds in the chain. In unsaturated fatty acids, there’s at least one double bond in the carbon chain; at least one carbon atom has a double bond with one of its adjacent carbons, a single bond with the other, and is also bound to one hydrogen (one double bond plus two single bonds equals all four binding spaces occupied). This means that, compared to a saturated fatty acid, one binding space along the chain that could be filled with a hydrogen is not. Thus the chain is not “saturated” with hydrogens. Fatty acids can be further subcategorized as either monounsaturated — meaning there’s only one double bond in the chain — or polyunsaturated — more than one double bond in the chain. Cis and trans fatty acids. Trans fats are the evil fats, the ones that really gum up your arteries and that New York City banned in restaurants a few years back. When thinking of the chemistry of fat, however, that word trans tells us something about what double bonds do to the structure of an unsaturated fatty acid’s carbon chain. A double bond creates a kink or bend in the chain. What happens to that kink — how big of a bend it is — depends on where the hydrogen atoms bound to the double-bound carbons position themselves. If the hydrogens end up next to each other on the same side of the chain, the molecule is called a cis unsaturated fatty acid (cis being Latin for “on the same side”). 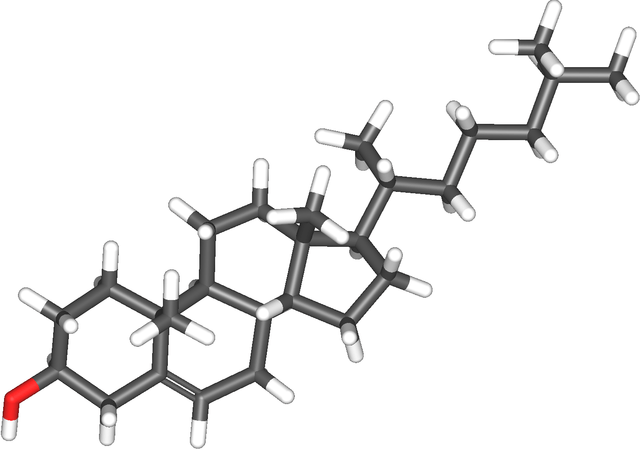 This produces a more pronounced bend in the molecule. If the hydrogens end up on opposite sides of the chain, the molecule is a trans unsaturated fatty acid (trans from the Latin, “across”). Trans fatty acids’ chains are straighter than those of cis fatty acids, which allows trans fats to clump together more efficiently. Omega-3 fatty acids. You’ve heard of omega-3 fatty acids, and likely omega-6s, maybe even omega-9s. But what do those words mean? They also help describe the structure of an unsaturated fatty acid: they tell you where the first double bond is.When chemists look down a fatty acid’s carbon-and-hydrogen chain, they call the last carbon in the chain the omega carbon (from ω, the last letter of the Greek alphabet). They then count inward from omega until they hit the first double bond, usually at the third carbon in (omega-3), sixth carbon in (omega-6) or ninth carbon in (omega-9). Triglycerides. Three fatty acids joined together at the carboxyl group by a molecule of glycerol (another organic compound). The fatty acids can be saturated or unsaturated, cis or trans, and most are long chain (see how all of this is coming together?). Most of the fat you find in food and in us is found in this triple form; it’s also the form in which our cells store fat. The oil in your skin, called sebum, is made up largely of triglycerides. Lipoproteins. Particles made of lipids (lipo-) and proteins that help transport triglycerides and cholesterol through the body. Our blood and the liquid inside cells (the cytoplasm) are mostly water, and triglycerides and cholesterol aren’t big fans of water. Lipoproteins form a shell that shields them from water so they can be carried where needed within the body and within individual cells. There are five forms of lipoprotein particles, two of which you’ve probably heard about: high density lipoprotein (HDL) and low density lipoprotein (LDL). They differ in their density (how tightly packed they are) and their proportion of protein to lipid. Different lipoproteins carry different lipids, based on which proteins are part of the lipoprotein shell. When your doctor talks to you about your HDL and LDL cholesterol levels, what she’s really talking about is cholesterol packaged in lipoproteins. 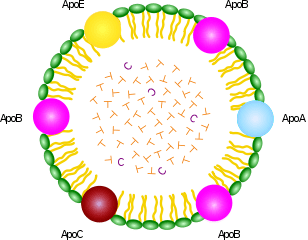 HDL cholesterol lipoproteins (called “good” cholesterol) scavenge cholesterol from the blood and take it to the liver and other organs to be turned into bile or hormones. LDL cholesterol lipoproteins (“bad” cholesterol) carry cholesterol to cells that need it, but are the ones that can build up in the blood stream and form plaques and lead to hardening of the arteries (atherosclerosis). One more player to introduce here, folks, we’re almost there…. Cholesterol. A lipid — but not a fat — and an important one at that. It’s the starting material for many of the hormones we make, and also of vitamin D (production of which by our cells is triggered by sunlight). In animals, cholesterol is also an important component of cell membranes (the lipid wrapping around every cell). We get it from our diet, but our cells can also make it if need be. Its name comes from a combination of the Greek words chole (“bile”) and steros (“solid”), with the suffix -ol (which in organic chemistry denotes an alcohol), and reflects the fact that cholesterol was first identified in solid form in gallstones (which form from bile). But now when you hear about saturated or unsaturated fats, omega-3s and cholesterol, I hope you stop for a sec and try to picture in your mind what those molecules look like as they float around in your body doing a lot of good, and sometimes bad. I want to give a shout-out to Claire McCarthy, MD, (aka the MD Mama) with whom I work at Boston Children’s Hospital, for helping me put the list together. Is there anything you think I missed? Let me know in the comments!